Final four time is here! Make your vote count and enter it by Monday, March 31st to decide which hero and villain will be duking it out in the finale. 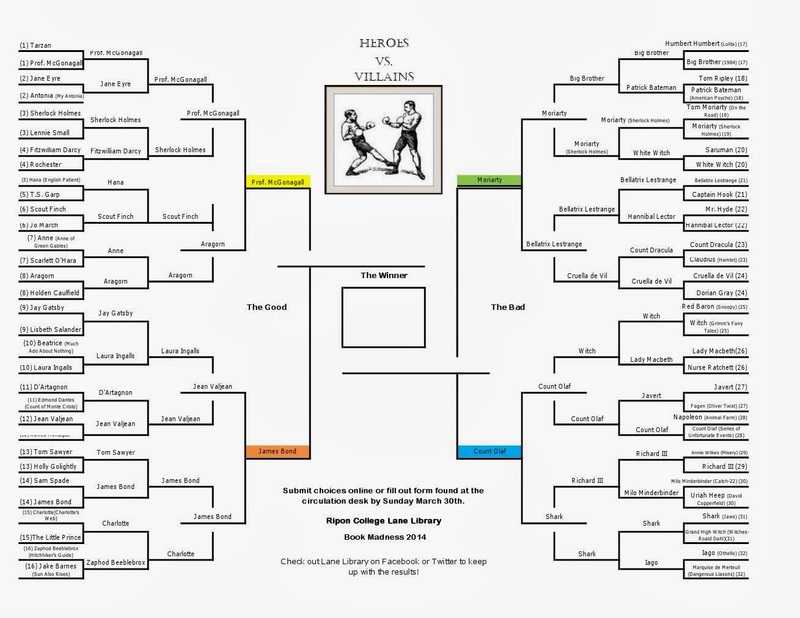 Curious to see how we ended up with Professor McGonagall vs. James Bond and Moriarty vs. Count Olaf? Look at the complete bracket below. The last round was very close, with Moriarty making a late surge to beat Bellatrix Lestrange 52% to 48%. The Shark also was our great underdog (with 42%), but he didn't have enough votes to pull it out against Count Olaf (58%). Click on the picture below to see the names a little better, but you might want to get your glasses out once again. Voting on our Final Four Heroes and Villains will continue through Sunday, March 30th, and our final Hero and Villain battle will be announced on Monday, March 31st; stay tuned to our Facebook and Twitter pages for updates. Voting is open to everyone, but we only have a few short days before one Villain and one Hero will go against each other based on your choices!